Safi al-Kaseasbeh, center, father of Islamic State captive Jordanian pilot Mu'ath al-Kaseasbeh, stands before a news conference where he asked Islamic State fighters to pardon and release his son, in Amman, Feb. 1, 2015. The fate of a Jordanian pilot held by the Islamic State group has raised public pressure on King Abdullah over his country's role in the U.S.-led military campaign against the hardline group in Syria, fueling the risk of broader discontent in the U.S. ally. After his capture in December, militants released pictures of the young pilot Mu'ath al-Kaseasbeh being led out of the water by fighters. His F-16 jet had smashed onto the banks of the Euphrates River in Islamic State's stronghold in northern Syria. The images of the young, newly wed pilot shocked Jordanians and brought home the stakes of the U.S. ally's involvement the war. 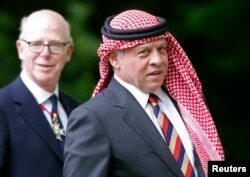 FILE - King Abdullah of Jordan is shown in London May 11, 2014. King Abdullah has defended the campaign, saying that moderate Muslims need to combat a group whose ideology and brutality have insulted the spirit of Islam. But in Kaseasbeh's hometown of Karak dozens of young people protested, chanting anti-coalition slogans and calling on the king to pull out of the campaign. "We will not be a sacrificial cow for America!" angry youths chanted last month in a city whose tribes have long been a bulwark of support for the Hashemite monarchy. Although few believe the crisis will compel Jordan to withdraw completely from the campaign, it may take a more low-key role like in the past, analysts and diplomats said. King Abdullah's father, King Hussein, did not take part in a U.S.-led military campaign against former Iraqi dictator Saddam Hussein after his invasion of Kuwait in 1990, going along with public opinion, which was against military involvement. By contrast, his son has taken a bolder role in this campaign by sending its jets to Syria -- the first time Jordan took part on bombing missions abroad rather than just providing intelligence and logistical support. King Abdullah's stance stems from his concern about the heightened threat of jihadis to his kingdom. Al-Qaida launched a series of deadly attacks in Jordan, including a bombing on a hotel in Amman in 2005 that killed 60 people. The Islamic State group has called for the release of Sajida al-Rishawi, one of the hotel attackers who was convicted after her explosive belt failed to detonate. It has said it will spare Kaseasbeh's life if she is let go but has not said it will release the pilot. Seeking to rally his people, King Abdullah has said concern about the pilot's plight united all Jordanians and his capture proved the war must be won. But as he comforted Kaseasbeh's parents and wife in the royal palace, demonstrations took place. "There is not a hour in the day that me and the armed forces are not working on this, our hero the pilot. Unfortunately the war today is one within the Islamic world and it's our war," the king told a group of tribal elders in a visit 10 days ago. The case has polarized Jordanians. Nationalists say it is not time for recriminations and have called for rallying behind the throne while others say they will lay the blame on the country's political rulers if the pilot is killed. "People will blame the Jordanian regime and they will say why did you send him to this war. No one will blame Islamic State if it executes him, it will only increase support for them," said Ali Dalaen, a former deputy from the pilot's hometown. He led a demonstration on Friday calling for an end to military involvement and accusing the government of not negotiating seriously with the Islamic State group. Some Jordanians have even raised fears that Jordan would send land troops to battle the Islamic State group, which is also known by the Arabic acronym Daesh. "We insist this is not our war and if Daesh unfortunately sacrifices our son, we hope the wisdom of the government and the king would be furthest away from participating in a land campaign," said Hind al-Fayez, a deputy from the powerful Bani Sakhr tribe. Her comments provoked a strong backlash. Islamic State militants have released three emotive videos in response to repeated appeals by the family. The group said their son's bombing missions had been responsible for the deaths of women and children. Observers said the Islamic State group is trying to deepen domestic rifts in a country whose security forces are growing increasingly alarmed by the appeal of jihadist ideology, especially in impoverished cities across the kingdom. Dozens of youths even from the pilot's hometown have traveled over the border to fight alongside hardline groups in Syria and as far away as Afghanistan. "It's an impossible situation for (Jordan). They don't have a decent hand," a Western diplomat in Amman said. "It's clear that Daesh (Islamic State) is looking to manipulate the political space with Jordan, and unfortunately they are very adept at that."